A.W.A.K.E stands for All Wonderful Adventures Kindle Enthusiasm. This London-based label is inspired by characters from history, art and film. The collection is very eye-catching and has a twist of edginess yet it’s still wearable. 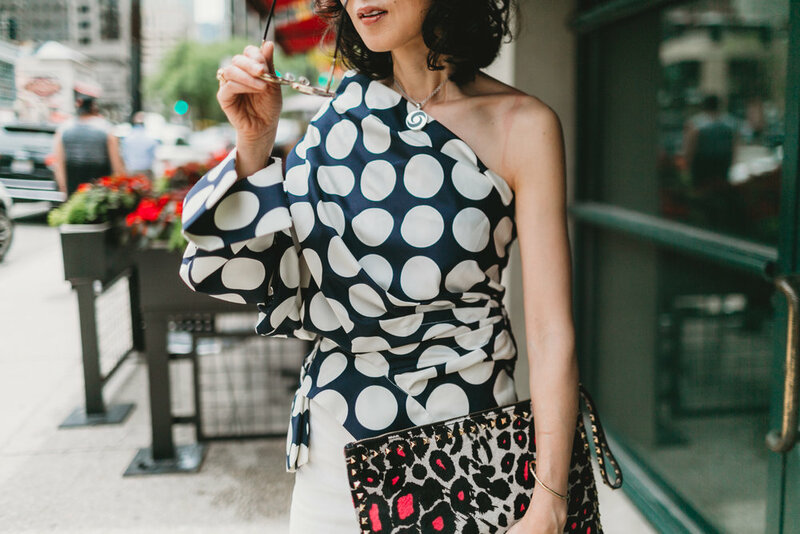 When an asymmetrical silhouette and one-shoulder neckline are combined together with a giant polka-dot print, this super-chic and edgy blouse is born. There are endless ways to style this modern blouse. I paired it with a white flare pants and white Self Portrait heels. The trick to have longer looking legs is to dress the pants/skirts the same color as your shoes. You can dress it up with a pair of black flare pants or a skirt. You can dress it down with a pair of your favorite jeans. Either way this blouse will make you stand out in the crowd. With the designer sale going on, this is absolutely a piece that you would wear over and over again . Plus what’s better than 50% off for a stunning designer piece?